From Things Cooks Love: Implements. Ingredients. Recipes. Throughout France, you will find small restaurants, often tucked away on side streets, specializing in crepes. 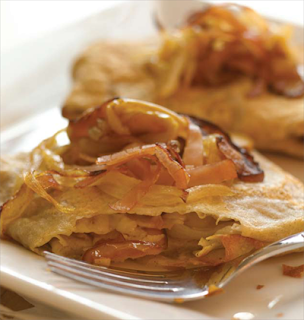 In Brittany, the crepes are made with buckwheat flour and the typical filling is a smear of salted butter, cheese, ham or bacon, thinly sliced fruit, and/or eggs. In most of France, crepes are rolled up or folded into half or quarter circles, but in Brittany, where they are sometimes called galettes, they are folded differently. The filling is spread in the center of the pancake, the four rounded sides are folded in over the filling, forming a square, and then the crepe is inverted onto a serving plate. 1. Make the crepe batter: In a large bowl, stir together the buckwheat flour, all-purpose flour, and salt. In a small bowl, whisk the eggs until well blended; stir in the water and butter. Gradually whisk the egg mixture into the flour mixture until the batter is smooth. Cover and refrigerate for 1 hour. The batter should be the consistency of heavy cream. If it is too thick, whisk in additional water, 1 tablespoon at a time. 2. While the batter is resting, prepare the filling: In a large skillet, melt the butter over medium-low heat. Add the onions, increase the heat to medium, and cook, stirring, for 5 minutes. Add the apples and cook, stirring, for 10 to 15 minutes, until the apples begin to brown and have softened. Add the ham and sprinkle with the lemon juice, nutmeg, and salt. Cover and set aside until ready to fill the crepes. 3. Heat a 9- to 11-inch crepe pan over medium-low heat until hot enough for a drop of water to sizzle on contact. Brush the surface of the crepe pan with a thin film of the melted butter. Blot any excess with the tip of a paper towel. Stir the crepe batter well with the whisk. Ladle about ¹⁄3 cup of the batter into the heated pan, and simultaneously tilt and roll the pan from side to side to coat the surface with a thin layer of batter. Cook for 1 minute, or until the edges begin to set. Run the tip of a small, narrow rubber spatula under the edges of the crepe to loosen it from the pan. Use your fingertips to lift the crepe and quickly flip it over. Cook the other side for 30 seconds, or until the batter is set into a thin pancake. Do not brown the crepe or cook it until crisp. Transfer the crepe to a large, round plate. Repeat with the remaining batter, brushing the pan with more butter if necessary. Stack the crepes as they are made. You should have 12 crepes. If making ahead, wrap the crepes in plastic wrap or aluminum foil to prevent drying out. The crepes can be refrigerated for up to 2 days. same way. Reserve the remaining filling. 5. Just before serving, brush the smooth top of each crepe with a thin film of the softened butter. Reheat the remaining apple filling and spoon a portion on top of each crepe. Serve at once.